Celebrations for Europe Month continued in Zambia this weekend, with the carnival-themed CSO Fair, which took place in Lusaka on Saturday. The event which was managed by Landell Mills in cooperation with our partner, Ku-Atenga Media, proved to be a great success for the second year in a row. The CSO Fair aimed to increase visibility of the work carried out by civil society organisations in Zambia and the support they receive from the European Union and its Member States. 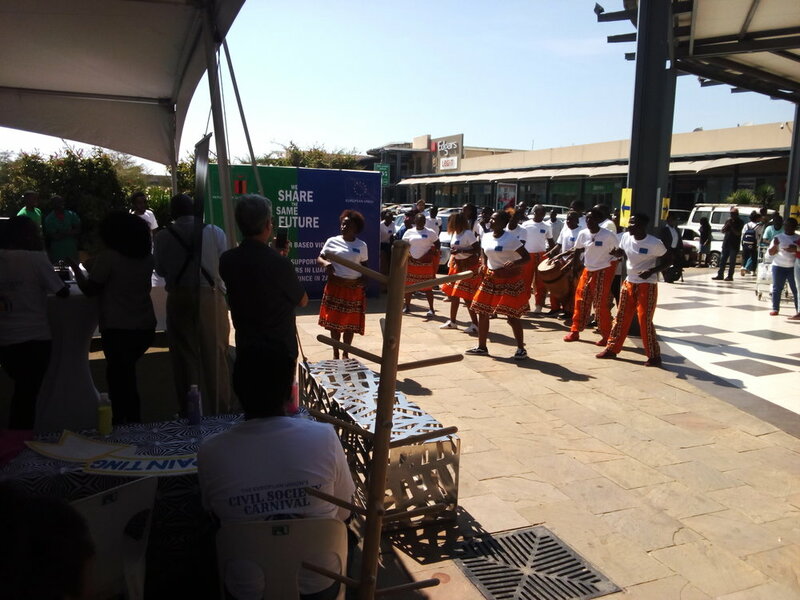 This year’s event saw 40 participating CSOs (civil society organisations) showcasing their work at the East Park Mall in Lusaka. Organisations from various sectors were represented at the Fair, including health, gender, education, agriculture, environment, government and finance. In line with this year’s carnival theme, many of the stallholders provided games and competitions for visitors to take part in. Attractions included a stilt walker, human statues, and hourly dance performances from Barefeet Theatre. Guests were encouraged to visit as many stands as possible and pick up a coupon from each one, which could then be exchanged for a prize, depending on how many they had collected. Prizes included toys, books, stationery and EU-branded t-shirts. Other popular activities at the event included an EU-based quiz and face painting. The Fair was officially opened by the Ambassador of the European Union to Zambia, H.E. Alessandro Mariani, and the Minister of Community Development and Social Services, Hon. Emerine Kabanshi M.P. The Ambassador also gave a number of live radio interviews during the Fair and the event was promoted heavily both online and within print media.